Research papers on Emerson and Thoreau show that Ralph Waldo Emerson spurred on the career of Henry David Thoreau as a friend, environmentalist and transcendentalist. Literature research papers on Emerson and Thoreau show that Ralph Waldo Emerson spurred on the career of Henry David Thoreau as a friend, environmentalist and transcendentalist. 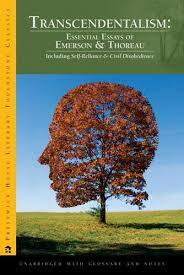 It is plain to see the influence of Emerson in Thoreau’s writing, especial his works on nature, like Walden. Walden is Thoreau’s guide to a simple life and the achievement of that through nature. How Emerson and Thoreau view nature and God is similar and seen in their works. We can see the influence of Emerson in Henry David Thoreau’s Walden. Walden is a document in which Thoreau converses freely with nature through Walden Pond. With a reputation of bottomlessness, the pond speaks most distinctively and profoundly to Thoreau of the unmeasurableness of life with materialistic means. His two-year sojourn in the woods represented a withdrawal from the luxuries of the "civilized life" and a deliberate return to simplicity. Rejecting materialism, Thoreau embraces spiritual regeneration, which is dramatized in Walden through the cycle of the year beginning with summer and ending in the rebirth of nature in spring. Walden is a plea for higher life — a life of individual freedom for reading, writing, and observing nature. Nature is both Emerson’s and Thoreau’s God. Although they both believe in God on a religious level, it is obvious to see that both tell of the evidence of God in nature. Emerson strongly believes that ethics should be the foundation of one's life and the foundation of these ethics can only be found in nature. All societies have sought some kind of religion to provide reassurance and to attempt to find answers to the questions in their lives; Emerson understands that all men need this, but he believes that it is found in one's natural surroundings, that the entire natural world is moral. Even though Emerson believes that nature exists only for man's use, he does not at all shy away from his natural power underpinnings. In this case, his "natural religion" is very similar to a more traditional one, it is based upon its own self expression. It, in itself, is moral. In contrast, Thoreau often appears as a Chanticleer proclaiming his difference to the world, "monarch of all I survey". He refines ("simplifies" is Thoreau's word) his life to a mockery of excesses he sees in others' lives - in clothes, houses, food, and the trappings of high social status. He has a " tailoress" but he makes his plain, practical clothing as fashionable as a gentleman-dandy's. Like a gentleman, he does not work at any recognized profession but, like a true gentleman, is skilled in many arts, a jack-of-all-trades. He is a "citizen of the world" he has made for himself, where he can be free, independent, a poet and seeker of his own Truth. Life in the Woods is filled with sarcasm, criticism, and observations of nature, life, and society, and is written in a very unique style. In contrast, Emerson is the quintessential philosopher, writing straightforward, matter-of-fact rhetoric that avoids symbolism and blatantly spells out the correlations between man and nature. Life in the Woods has been described as an elaborate system of circular imagery which centers on Walden Pond as a symbol of heaven, the ideal of perfection that should be striven for. Emerson is more realistic in his approach and offers man a communal relationship with the spirituality of nature rather than submitting to it. Life in the Woods is the reflection of Thoreau’s belief that heaven can be found on earth, in nature. Nature is both Emerson’s and Thoreau’s spirituality and is the transcendentalists path to fulfillment in this life. Rip Van Winkle and Walden - Below is a topic suggestion for a research paper to compare and contrast Washington Irving's Rip van Winkle and Henry David Thoreau's Walden. Civil Disobedience and Thoreau - Henry David Thoreau (1817-1862) remains one of the great American writers of the 19th century. Emerson and Slavery - Emerson and Slavery research papers explain how Emerson was an abolitionist during the days of slavery. Romantic Era Research Papers inspect the writings of different authors during this period. Order a research paper on the Romantic Era from Paper Masters. Self Reliance Emerson - Self-Reliance by Emerson essays look into Self-Reliance and point out that Emerson urges mankind to adopt an attitude of trust in oneself. Cathedral research papers examine Raymond Carver's short story about a blind man helping another man see. Transcendental Idealism research papers discuss the theory of German philosopher Immanuel Kant. Paper Masters writes custom research papers on Emerson and Thoreau and discuss their literary works.